A huge library of 529 production music tracks that will transform your home movies into blockbusters! 'Soundtracks for iMovie' gives all of you iLife users and fanatics access to the background tracks that the pros use to make your home and personal projects SIZZLE! Hollywood's top-tier film and TV music producers have put together this huge collection of 529 tracks to inspire your personal and academic projects and instantly give them that previously unattainable professional soundtrack to take them to the next level in an instant. Now there's no need to settle for cheesy music or chart hits that turn your project into a music video or amateur effort - you need soundtracks that build on your visuals, not detract from them. 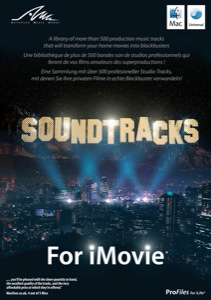 'Soundtracks for iMovie' gives you a huge library of high quality music, specifically designed for use 'to picture' so that you never need to compromise with a soundtrack that's anything less than the pros demand.